Not to be confused with The Beaches, Newfoundland and Labrador. For the band, see The Beaches (band). The Beaches (also known as "The Beach") is a neighbourhood in Toronto, Ontario, Canada. It is so named because of its four beaches situated on Lake Ontario. It is located east of downtown within the "Old" City of Toronto. The approximate boundaries of the neighbourhood are from Victoria Park Avenue on the east to Kingston Road on the north, to Coxwell Avenue on the west, south to Lake Ontario. The Beaches is part of the east-central district of Toronto. The commercial district of Queen Street East lies at the heart of The Beaches community. It is characterized by a large number of independent speciality stores. The stores along Queen are known to change tenants quite often causing the streetscape to change from year to year, sometimes drastically. The Beaches is characterized by a large number of independent boutiques along the neighbourhood's portion of Queen Street East. The side streets are mostly lined with semi-detached and large-scale Victorian, Edwardian and new-style houses. There are also low-rise apartment buildings and a few row-houses. Controversy has risen in recent years over new development in the neighbourhood that is changing the traditional aesthetic, with denser housing causing some residents to protect the traditional cottage-like appearance of the homes with heritage designations for some streets. There is an extensive park system along the Waterfront (with Kew Gardens being the only one that extends up to Queen Street) as well as a parks that follow a ravine (partially buried) that bisects the neighbourhood from North to South at Glen Manor Road. Kingston Road is a four-lane road along the northern section of the neighbourhood. Woodbine Avenue is a five-lane road originating from Lake Shore Boulevard at the Lake Ontario shoreline, running north. It is primarily residential. The beach itself is a single uninterrupted stretch of sandy shoreline bounded by the R. C. Harris Water Treatment Plant (locally known as the water works) to the east and Woodbine Beach Park (a small peninsula in Lake Ontario) to the west. A long boardwalk runs along most of its length with a portion of the Martin Goodman Trail bike path running parallel. Although it is continuous, there are four names which correspond each to approximately one quarter of the length of the beach (from east to west): Balmy Beach, Scarboro Beach, Kew Beach and Woodbine Beach. Woodbine Beach and Kew-Balmy Beach are Blue Flag certified for cleanliness and are suitable for swimming. In the 2006 Canadian census The Beach was covered by census tracts 0020.00, 0021.00, 0022.00, 0023.00, and 0024.00. According to that census, the neighbourhood has 20,416 residents, a 7.8% increase from the 2001 census. Average income is $67,536, well above the average for Toronto. The Beaches is known as being a great place to raise a family with very little crime as well as many parks and schools. View of Woodbine Beach, one of the four beach sections that make up the neighbourhood's waterfront. The neighbourhood is located to the East of Toronto's downtown, from Coxwell east to Victoria Park. The lakefront is divided into four sections; Woodbine Beach to the west, Kew Beach and Scarboro Beach in the centre, and Balmy Beach to the east. It is four beaches which give the neighbourhood its name and defining principal characteristic. Until Lake Shore Boulevard was extended to Woodbine Avenue in the 1950s, Woodbine Beach was not a bathing beach, but rather a desolate wooded area known as The Cut. And Woodbine Avenue was the western boundary of the neighbourhood. While the official City northern boundary ends at Kingston Road, the area to the north has become known as the 'Upper Beaches' according to real estate marketers. The area bounded by Queen Street, Woodbine and Kingston Road is nicknamed the 'Beach Triangle'. Ashbridge's Bay is a small body of water that was once part of the marsh that lay east of Toronto Islands and Toronto Harbour. The bay is named for the Ashbridge family that once lived nearby on a farm. Infill to form the Port Lands and building of the water treatment plant shrunk the size of the bay to the area between the Port Lands and Woodbine Beach. The current bay is surrounded by marinas, the treatment plant and a small tree lined section along Lake Shore Boulevard East such that the original natural shoreline has disappeared completely. The name of the community is the subject of a long-standing dispute. Some long-time local residents assert that "The Beach" is the proper historical name for the area, whereas others are of the view that "The Beaches" also has at least equal historical provenance and is additionally the more universally recognized neighbourhood name, particularly by non-residents. 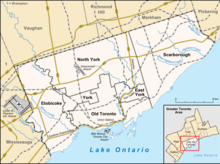 All government levels refer to the riding, or the ward in the case of the municipal government, as Beaches-East York. The former Beach Theatre, presently Beach Mall. A long standing issue in the community has been the area's name, whether its proper name is "The Beach" or "The Beaches". The dispute over the area's name reached a fever pitch in 1985, when the City of Toronto installed 14 street signs designating the neighbourhood as "The Beaches". The resulting controversy resulted in the eventual removal of the signs, although the municipal government continues to officially designate the area as "The Beaches". In early 2006 the local Beaches Business Improvement Area voted to place "The Beach" on signs slated to appear on new lampposts over the summer, but local outcry caused them to rescind that decision. The Beaches Business Improvement Area board subsequently held a poll (online, in person and by ballot) in April 2006 to determine whether the new street signs would be designated "The Beach" or "The Beaches", and 58% of participants selected "The Beach" as the name to appear on the signs. In fact, the two names have been used to refer to the area since the first homes were built in the 19th century. In his book, Accidental City: The Transformation of Toronto, Robert Fulford, himself a former resident, wrote: "the historical argument for 'the Beaches' as a name turns out to be at least as strong as the historical argument for 'the Beach'". "Pluralists" hold that since the area had four distinct beach areas, using the singular term is illogical. Those preferring the singular term "Beach" hold that the term has historically referred to the area as the four distinct beach areas merged. Historically, there are or were a number of institutions that used the term "Beach" in the singular, including the original Beach telephone exchange (1903 - 1920s), the Beach Hebrew Institute (1920), the Beach Theatre (1919 to the 1960s), and the Beach Streetcar (1923–1948). The singular form has also been adopted by the local historical society, which is called The Beach and East York Historical Society (from 1974). There are also numerous examples of early local institutions that use the plural form "Beaches", such as the Beaches Library (1915), the Beaches Presbyterian Church (1926), the Beaches Branch of the Canadian Legion and a local war monument in Kew Beach erected post WWII by the "Beaches Business Men's Association". In May 2009, the City of Toronto started the installation of "The Beach" signs along Queen Street. Despite the naming controversy, most Torontonians recognize either name as referring to this particular neighbourhood, even though there are several other beaches located elsewhere in the city. Kew Beach in 1918. Kew Gardens, which sat north to the beach, were appropriated by the Toronto Harbour Commission in the early 20th century. Originally a heavily wooded area dotted with private homes and swampland, the current shoreline and the Kew Gardens private park grounds were appropriated by the Toronto Harbour Commission in the early 1900s. The current beach was artificially enlarged and made continuous in 1930 with the use of wooden groynes. The public boardwalk and facilities were officially opened to the public in 1932. The beach is diminishing as the sand is continuously pushed by lake currents from east to west. Historically, the sand was, and to a lesser degree still is, replaced by new sand generated by the erosion of the Scarborough Bluffs to the east. This source of sand has been diminished by municipal efforts to reduce erosion of the bluffs, and groynes constructed of rocks have been used to stabilise the shoreline. Built in 1905, R. C. Harris Water Treatment Plant is a local landmark. In the early 1900s, the neighbourhood was the site of several amusement parks - Victoria Park (1878-1906), Munro Park (1896-1906), and Scarboro Beach Park (1907-1920s or till 1930). Today, their namesakes remain as streets. Beginning in 1890s there was a ferry service (Victoria Park Ferry) to the area (in addition to streetcar service on Queen Street) from Yonge Street and ended after the closure of the parks. Kew Gardens is a medium-sized park in the neighbourhood running from Queen Street to Lake Ontario, and includes the Alex Christie Bandstand for concerts. Every July, the neighbourhood celebrates the Beaches International Jazz Festival, drawing thousands to the area. However, now most of the performances occur at Woodbine Beach Park. Another notable site in the area is the R. C. Harris Water Treatment Plant, which has been featured in several television programs, as well as in the films "Half Baked", "In the Mouth of Madness", "Four Brothers" and "Undercover Brother", and in Michael Ondaatje's novel In the Skin of a Lion. Beaches branch of the Toronto Public Library. Built in 1916, it was one of eight Carnegie libraries in Toronto. The Goof – officially the Garden Gate Restaurant, a well-known Canadian Chinese restaurant in the Beach since 1952, located at 2379 Queen Street East. Secular English first language public schools are operated by the Toronto District School Board (TDSB). Publicly-funded English first language separate schools are operated by the Toronto Catholic District School Board. In addition to TCDSB/TDSB, applicable residents of The Beaches may also attend schools operated by the Conseil scolaire Viamonde (CSV), and the Conseil scolaire catholique MonAvenir (CSCM). Both school boards are a French first language public school boards, the former being secular, the latter being be a separate school board. However, neither CSCM/CSV operate a school in The Beaches. Malvern Collegiate Institute is a public secondary school operated by the Toronto District School Board. Glen Ames Senior Public School, a middle school (grades 7 and 8) located on Williamson Road at Hambley Ave, north of Queen St.
Blantyre PS, located on Blantyre Avenue, near the intersection of Victoria Park Avenue and Gerrard Street East in Scarborough. Courcelette PS, located on Fallingbrook Road, south of Kingston Road in Scarborough. Neil McNeil Catholic Secondary School is a Catholic secondary school operated by the Toronto Catholic District School Board. Georges Etienne Cartier, Catholic French Elementary School, located at 250 Gainsbourough Ave, off Upper Gerrard, East of Coxwell Ave. The Beach School was a private, tuition-based democratic school located in the Corpus Christi School building on Edgewood Ave near Kingston Road and Dundas Street East, just outside the Beaches area. Its curriculum was based on the Sudbury principles of education. The school opened in the fall of 2003 and closed in June 2008 due to low enrollment. The building was demolished in the spring of 2011 for construction of a new housing development. The Beaches community is served by several locally distributed newspapers including the Beach Metro Community News and the Beach-Riverdale Mirror (run by the Metroland subsidiary of the Toronto Star) and the "Beaches Living" magazine. The area is in the political riding of Beaches—East York, and is represented in the Legislative Assembly of Ontario by Rima Berns-McGown, since June 2018. Federally, the riding elected Liberal Nathaniel Erskine-Smith in 2015. The area's city councillor is Mary-Margaret McMahon. McMahon did not seek reelection and a new Councillor, Brad Bradford, elected October 22, 2018, will take office in December 2018. The area's new school trustee is Michelle Aarts. A streetcar of the 501 Queen line at The Beaches. The Toronto Transit Commission operates several streetcar lines in the area. Streetcars heading to and from downtown Toronto run east-west along Queen Street East (route 501) as well as along Kingston Road (routes 502 and 503) and Gerrard Street East (route 506), and a bus line runs north-south along Woodbine Avenue to Woodbine subway station (route 92). Another north-south bus line snakes its way along several side streets before making its way to the Main Street subway station (route 64). A third bus line runs north-south down Coxwell Avenue from Coxwell subway station and then turns east travelling the entire length of Kingston Road as far as Victoria Park Avenue (only from 7PM-5AM on weekday evenings, and 24hrs on weekends) (route 22A). Jordan and Kylie Miller of the band "The Beaches"
^ a b "The Beaches neighbourhood profile". City of Toronto. Retrieved December 1, 2008. ^ Merringer, Ian (May 11, 2012). "Condos may be okay for Toronto, but this is the Beach". The Globe and Mail. Retrieved November 19, 2018. ^ Cook, Michael. "Beneath Toronto's East End: The East Toronto and Midway Sewer System". Retrieved March 29, 2013. ^ Rush, Curtis. Is it Beaches or The Beach? Passions run deep in neighbourhood. Vote will decide how signs will read., The Toronto Star, April 5, 2006. B4. ^ a b Wickens, Stephen. Once and for all, is it Beach or Beaches? The Globe and Mail, February 4, 2006. M1. ^ Campbell, Mary. Are you a Beacher or a Beacheser? Beach Metro News, April 4, 2006. p4. ^ Spenser, Steven. Carved in Stone: The Beaches. Beach Metro News, April 4, 2006. p5. ^ "Name Finally Official As City Unveils "Beach" Signs". City News. May 22, 2009. Archived from the original on May 26, 2009. ^ The birth of a storyteller, February 19, 1997. CBC Archives. Retrieved November 29, 2007. ^ Chapter 1: "I'll Be a Millionaire!" Archived May 24, 2008, at the Wayback MachineCareer Biography, Jack Kent Cooke Foundation. Retrieved November 29, 2007. ^ Varga, Darrell. Locating the Artist in Thirty-Two Short Films About Glenn Gould. Canadian Journal of Film Studies, Fall 2003. Retrieved November 29, 2007. ^ Fulford, Robert[permanent dead link]. Culture, Heritage, Recreation. Government of Canada Official Site. Retrieved November 29, 2007. ^ "Ken Westerfield HOF". TUC Hall of Fame. 2010. Retrieved December 12, 2012. ^ "History of Toronto Ultimate". TUC History. 2010. Retrieved December 12, 2012. ^ Parker, Beth. "Young Beacher: Penny Oleksiak, Fast Track to Rio 2016 Olympics". Beaches Living. Retrieved December 14, 2016. ^ "I'm Patrick J. Adams and I play Mike Ross on Suits. Ask me anything. • /r/IAmA". reddit. Retrieved January 26, 2017. ^ Grewal, San. Class act: Meet Jamie Johnston, soon to make you swoon on Degrassi. Acting resume ensures new kid won't be getting picked on. Toronto Star. July 12, 2005. ^ "Degrassi their home away from home - The Star". thestar.com. Retrieved April 11, 2018. ^ Field, Rebecca (July 13, 2013). "Beach flutist takes to stage at Beaches jazz fest". insidetoronto.com. Retrieved April 11, 2018. ^ Neil McNeil High School (Catholic Secondary School) Official Site Archived December 12, 2007, at the Wayback Machine. Retrieved November 30, 2007. ^ a b c d Malvern Collegiate Archived November 7, 2007, at the Wayback Machine. Glenn Gould Foundation. Retrieved November 30, 2007. ^ WIER School Profiles - M-Z Archived November 27, 2007, at the Wayback Machine. Writers in Electronic Residence. Retrieved November 30, 2007. ^ "Glenn Gould". IMDb. Retrieved April 11, 2018. The Beach in Pictures: 1793–1932. Mary Campbell and Barbara Myrvold. 1988. Toronto Public Library Board. The Boardwalk Album. Barbaranne Boyer. 2000. Boston Mills Press. Historical Walking Tour of Kew Beach. Mary Campbell and Barbara Myrvold. 1995. Toronto Public Library Board. Cochrane, Glenn & Jean. The Beach - An Illustrated History from the Lake to Kingston Road. Toronto: ECW Press, 2009. Wikimedia Commons has media related to The Beaches.